For other uses, see 10,000 (disambiguation). Route of Xenophon and the Ten Thousand in the Achaemenid Empire. The Ten Thousand (Ancient Greek: οἱ Μύριοι, oi Myrioi) was a force of mercenary units, mainly Greek, employed by Cyrus the Younger to attempt to wrest the throne of the Persian Empire from his brother, Artaxerxes II. Their march to the Battle of Cunaxa and back to Greece (401–399 BC) was recorded by Xenophon (one of their leaders) in his work The Anabasis. The "ten thousand" marched inland and fought the Battle of Cunaxa and then marched back to Greece during the years 401 BC to 399 BC. Xenophon stated in The Anabasis that the Greek heavy troops scattered their opposition twice during the battle; only one Greek was even wounded. Only after the battle did they hear that Cyrus had been killed, making their victory irrelevant and the expedition a failure. The "ten thousand" were in the middle of a very large empire with no food, no employer, and no reliable friends. They offered to make their Persian ally Ariaeus king, but he refused on the grounds that he was not of royal blood and so would not find enough support among the Persians to succeed. They offered their services to Tissaphernes, a leading satrap of Artaxerxes, but he refused them, and they refused to surrender to him. Tissaphernes was left with a problem; a large army of heavy troops, which he could not defeat by frontal assault. He supplied them with food and, after a long wait, led them northwards for home, meanwhile detaching the Persian general Ariaeus and his light troops from their cause. The Greek senior officers accepted the invitation of Tissaphernes to a feast, where they were made prisoner, taken up to the king, and decapitated. The Greeks elected new officers, among them Xenophon and set out to march northwards to the Black Sea through Corduene and Armenia. The Ten Thousand eventually made their way into the land of the Carduchians, a wild tribe inhabiting the mountains of modern southeastern Turkey. The Carduchians were "a fierce, war-loving race, who had never been conquered. Once the Great King had sent into their country an army of 120,000 men, to subdue them, but of all that great host not one had ever seen his home again." The Ten Thousand made their way in and were fired at by stones and arrows for several days before they reached a defile where the main Carduchian host sat. In the Battle of the Carduchian Defile, Xenophon had 8,000 men feint at this host and marched the other 2,000 to a pass revealed by a prisoner under the cover of a rainstorm, and "having made their way to the rear of the main pass, at daylight, under cover of the morning mist, they boldly pushed in upon the astonished Carducians. The blare of their many trumpets gave notice of their successful detour to Xenophon, as well as added to the confusion of the enemy. The main army at once joined in the attack from the valley side, and the Carducians were driven from their stronghold." After heavy mountain fighting in which Xenophon showed the calm and patience needed for the situation, the Greeks made their way to the northern foothills of the mountains at the Centrites River, only to find a major Persian force blocking the route north. With the Carduchians surging toward the Greek rear, Xenophon again faced the threat of total destruction in battle. Xenophon's scouts quickly found another ford, but the Persians moved and blocked this as well. Xenophon, in a cunning tactic recapitulated by Robert E. Lee before the Seven Days Battle, sent a small force back toward the other ford, causing the anxious Persians to detach a major part of their force parallel. Xenophon stormed and completely overwhelmed the force at his ford, while the Greek detachment made a forced march to this bridgehead. This was among the first attacks in depth ever made, 23 years after Delium and 30 years before Epaminondas’ more famous use of it at Leuctra. Thálatta! Thálatta! ("The Sea! The Sea!"). Trapezus (Trebizond) was the first Greek city the Ten Thousand reached on their retreat from inland Persia. 19th c. illustration by Herman Vogel. On their arrival at Trapezus on the Euxine, the Greek mercenaries sent their Spartan general, Cheirisophus to Anaxibius, the Spartan admiral stationed at Byzantium in 400 BC, to obtain a sufficient number of ships to transport them to Europe. However, when Cheirisophus met them again at Sinope, he brought back nothing from Anaxibius but civil words and a promise of employment and pay as soon as they came out of the Euxine. Armoured cavalry of Hellespontine Phrygia attacking a Greek psiloi at the time of Pharnabazus, Altıkulaç Sarcophagus, early 4th century BC. The Ten Thousand under Xenophon continued to the west, some by ship but most of them by land, and arrived in Bithynia after an abundance of skirmishes and plunders. Pharnabazus, satrap of Hellespontine Phrygia was involved in helping the Bithynians against the plundering raids of the Greek Ten Thousand who were returning from their failed campaign in the center of the Achaemenid Empire. He was also trying to stop them from entering Hellespontine Phrygia. 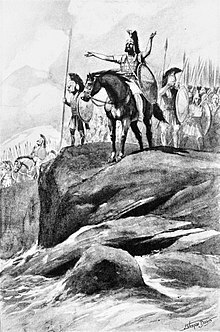 His cavalry is said to have killed about 500 Greek mercenaries on that occasion, and mounted several raids on the Greek mercenaries. Achaemenid satrap Pharnabazus fought the Ten Thousand to prevent them from plundering Bithynia and Hellespontine Phrygia. Pharnabazus then organized with Anaxibius for the rest of the Greek mercenaries to be shipped out of the Asian continent to Byzantium. On the arrival of the Ten Thousand at Chrysopolis, on the Asiatic shore of the Bosporus, Anaxibius, being bribed by Pharnabazus with great promises to withdraw them from his satrapy, engaged to furnish them with pay, and brought them over to Byzantium. Here he attempted to get rid of them, and to send them forward on their march without fulfilling his agreement. A fight ensued, in which Anaxibius was compelled to flee for refuge to the Acropolis, and which was quelled only by the remonstrances of Xenophon. Soon after this the Greeks left the town under the command of the adventurer Coeratades, and Anaxibius issued a proclamation, subsequently acted on by the harmost Aristarchus, that all of Cyrus's soldiers found in Byzantium should be sold as slaves. In addition, they were backed up by a fleet of 35 triremes under Pythagoras the Spartan and 25 triremes under Tamos the Egyptian, as well as 100,000 Persian troops under Ariaeus the Persian (although Xenophon lists them as 100,000, most modern historians believe Ariaeus' troops were only around 20,000). Until shortly after the Battle of Cunaxa, the Spartan general Clearchus was recognized as the commander of the army. When Tissaphernes arrested and executed Clearchus, Proxenus, Menon, Agias (possibly the same person as Sophaenetus), and Socrates, their places were taken by Xenophon the Athenian, Timasion the Dardanian, Xanthicles the Achaean, Cleanor the Orchomenian, and Philesius the Achaean, with the Spartan Cheirisophus as the general commander. When the Ten Thousand started their journey in 401 BC, Xenophon tells us that they numbered around 10,400. At the time Xenophon left them two years later, their number had dwindled to just under 6,000. The novel The Sea, the Sea by Iris Murdoch, winner of the 1978 Booker Prize was named for this event. David Drake's 1988 novel The Forlorn Hope features a plot revolving around a group of mercenaries caught behind enemy lines, who must fight their way out. 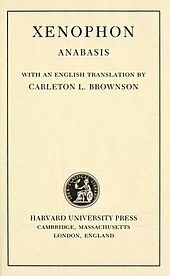 Drake's own writings describe Xenophon's Anabasis as the model for the first segment of the book. Harold Coyle's 1993 novel The Ten Thousand shows the bulk of the US Forces in modern Europe fighting their way across and out of Germany after the Germans steal nuclear weapons being removed from Ukraine. The 2001 novel The Ten Thousand by Michael Curtis Ford is a fictional account of this group's exploits. Shane Brennan's In the Tracks of the Ten Thousand: A Journey on Foot through Turkey, Syria and Iraq (London: Robert Hale, 2005) is an account of his 2000 journey to re-trace the steps of the Ten Thousand. Valerio Massimo Manfredi's 2007 novel L'armata perduta (The Lost Army) tells the story of the army told through Abira, a Syrian girl, who decides to follow a Greek warrior named Xeno (Xenophon). Paul Kearney's 2008 novel The Ten Thousand is set in a fantasy world based on Xenophon's record of the historical Ten Thousand. John Ringo's 2008 novel The Last Centurion tells the story of a U.S. Stryker company left in Iran after a worldwide plague which must repeat the journey of the Ten Thousand. The Ten Thousand and Anabasis are frequently mentioned. The 1965 novel The Warriors is inspired by Anabasis. It tells the story of a gang (the Warriors) from New York's Coney Island forced to fight their way home from the Bronx after an all-city gang meeting at which a would-be gang-unifier is killed, the Dominators are blamed, and the Dominators lose their leader. The novel was adapted into the 1979 film The Warriors. In the film, the would-be-emperor figure is named Cyrus, the Coney Island gang's fallen leader is named Cleon, and the film's final scenes take place at the edge of the sea. The 1997 video game Age of Empires has a campaign mission called "Xenophon's March" based on this event. In the mission, the player has to lead a squad of Greek troops through hostile territory in order to get home. ^ Xenophon (1904) [c. 370 BCE (repr. 1961)]. Anabasis. Oxford, UK: Clarendon Press. Book 4, Chapter 7, Section 24. Retrieved 3 January 2014. ^ Brownson, Carlson L. (Carleton Lewis) (1883). Xenophon;. Cambridge, Mass. : Harvard University Press. p. 479. ^ Brownson, Carlson L. (Carleton Lewis) (1886). Xenophon;. Cambridge, Mass. : Harvard University Press. p. 513. ^ Jordison, Sam (11 February 2009). "Booker Club: The Sea, the Sea". The Guardian. Retrieved 3 January 2014. ^ Tuplin, Christopher (2005). Tsetskhladze, Gocha R. (ed.). "Ancient West & East, Issue 1". Brill. pp. 212–213. Retrieved 3 January 2014. ^ Curtis Ford, Michael (2002). The Ten Thousand: A Novel of Ancient Greece. St. Martin's Griffin. ISBN 978-1250062567. Álvarez Rico, Mauricio (2002). "The Greek military camp in the Ten Thousand's army". Gladius. 22: 29–56. ISSN 0436-029X.